Our Karate School is located in Pierrefonds in Montreal West Island. We have been teaching karaté since 1998 and we count several families among our members. Our Karate Program for Families offers parents and their kids the opportunity to share a common activity as they discover the practice of a traditional martial art. Karate allows everyone to improve in terms of cardiovascular capacity, strenght, concentration and self confidence. Our instructors take into account the needs of everyone, so that all family members benefit from their training. Instead of sitting waiting for your kid to finish her class, you train at the same time! 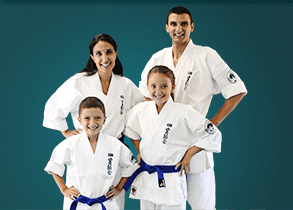 You optimize your use of time and enjoy the benefits of karate training with your child. No rush to get to the gym! Parents and kids learn the basics of a traditional martial art in an inclusive environment! We welcome students of all abilities, starting at the age of 4. We strive to meet the needs of each student by focusing on his strengths and making sure he fits well in the group. Parents and kids live through the same experiences at the same time! You understand better how your child feels in a new situation. Young kids are sometimes shy and anxious when faced with new challenges. Your presence on the mat can make a difference and help your child make his ‘first kick’! Through the years, parents and children develop a close relationship, thanks to the regular practice of a common activity. All family members gain confidence and acquire a safe behavior that protect them in their daily life. PARENTS AND KIDS BENEFIT FROM TRAINING TOGETHER! Nowadays, parents and kids often lead parallel lives: work/school, recreation for children/adult sports, etc.. … There is only little family time left. Our karate program allows parents and kids to learn together a traditional martial art. Kanreikai karate focuses on a physical workout in an environment of respect, discipline and perseverance. Such values are closely related to the physical, psychological and social well-being of each family member and contribute to the smooth functioning of the family. The practice of karate as a family becomes a shared experience that promotes exchanges between family members. It also favours new ties among different families. New friendships develop between kids and parents who share the same interest and have common values. Karate for the family is more popular than ever at Montreal Kanreikai Karate school! It is a great way for your family to spend time together and improve everyone?s physical fitness in a friendly and safe environment!